Do you want to get more bass response from your 6" x 9" speakers? We have high quality speaker enclosures that will add some more bass to your system. 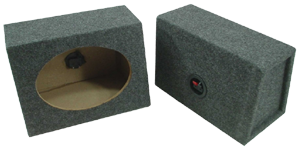 Our 6" x 9" speaker boxes can be mounted anywhere, allowing you to use 6" x 9" speakers in almost any vehicle. Our boxes are constructed with high quality MDF wood.